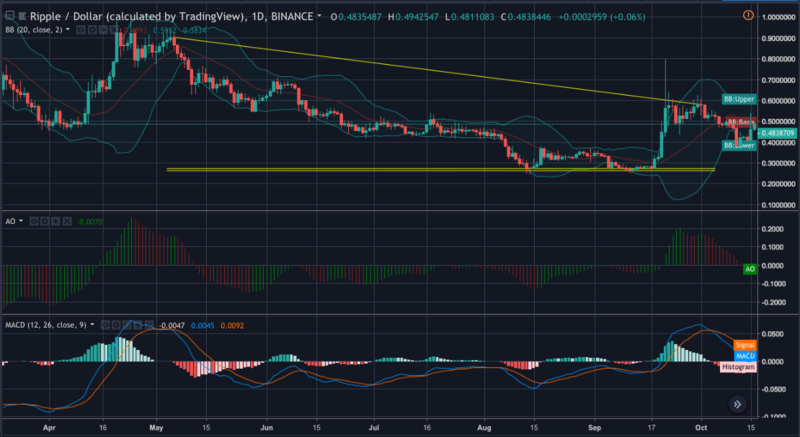 XRP [XRP/USD] Technical Analysis: The coin to tame the wild bull? XRP, the 4th largest cryptocurrency in the world and currently making headlines all over the blockchain space with its product launches and adoption, has begun moving sideways in the market again. This comes after the XRP market hike of more than 10% this month. At the time of writing, the coin has moved up by 11.92% in the course of 7 days. It is currently trading at $0.47 with a market cap of $18.8 billion and a 24-hour trading volume of $475.5 million. In this timeframe, the support line is stretched from $0.41 to $0.48 whereas the resistance point is set at $0.5. The uptrend is likely to form an ascending triangle with the line of resistance, hence depicting the bull’s presence. Meanwhile, the Parabolic SAR is predicting an upward trend, signaling a bullish market for XRP. The dots are placed underneath the candlesticks to show support. The Chaikin Money Flow [CMF] indicator is also in the green zone and highly bullish on the cryptocurrency. It is currently moving upwards, not displaying any signs of a losing game. The RSI is conveniently moving in a healthy range, suggestive of a bull market for XRP. It previously touched the overbought zone and returned to the possibility of a healthy buying activity in the market. In the 1-day candlesticks, the downtrend ranging from $0.9 to $0.58 is not showing any significant coherence with the support in terms of intersection to indicate a trend breakout. However, the XRP market recently broke the first support, which was set at $0.27. The current support is holding the price above $0.26. The Bollinger Bands are not suggesting an increased volatility in the XRP market and running a tunnel-pattern along the prices. The Awesome Oscillator was severely skeptical of a healthy XRP market but is now flashing a green light to predict a bullish nature in the prices. On the other hand, The MACD is currently moving under the signal and looks ready to make a bullish crossover, now approaching upwards. 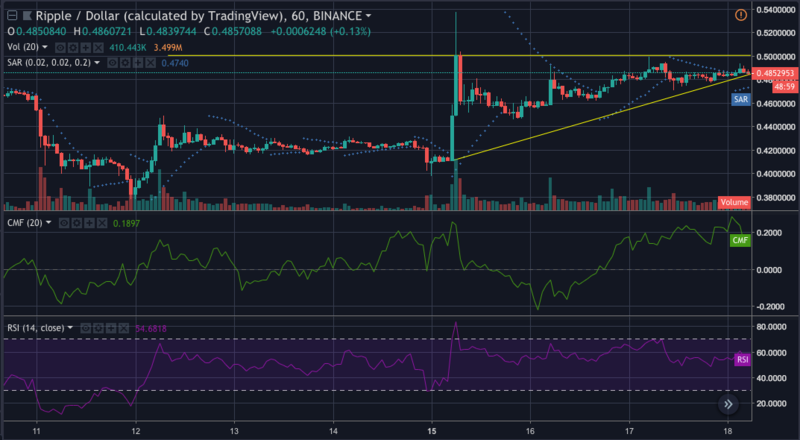 Most of the indicators in this technical analysis are fairly positive towards the future of the XRP price trend. The MACD is the only one that has not played along with its fellow indicators to go bullish on the coin.